I grew up in Huntington Beach, CA always being in or around the ocean and spending much of my youth surfing and fishing locally. I became obsessed with fly fishing after a trip with my uncle to the sierras when I was 10 years old in which I caught my first native rainbows. But growing up near the beach meant fly fishing the surf and that was no easy learning curve.. I spent a lot of time chasing corbina and barred surf perch, before I was out on a skiff pursuing yellowfin tuna and yellowtail. 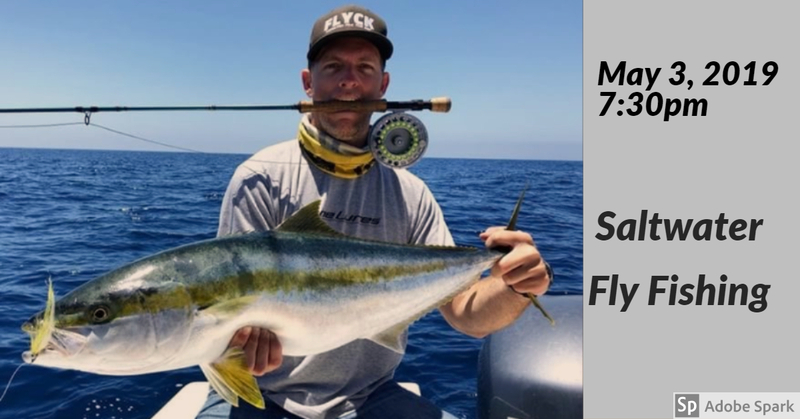 Years later I find myself extremely grateful for all of the fly fishing opportunities I’ve had, both locally and internationally, and the focus is now on sharing the amazing local saltwater fishery we have here in Southern California. I’ll tie a few Calico “Sculpin” flies and some “Yak hair Sardines” that we use for yellowtail before the meeting. Link below to “24 hours in LA” a Redington Fly Fishing film I helped with: we did the shark and calico sections on my boat. 7:30pm meeting starts and presentation.